The thick wall and ribbed box-type, meehanite cast construction, coupled with solid box guide ways on the X, Y, Z axes ensures a high level of quality and rigidity. A table size of 16.1 x 35.4 and load capacity of 1,100Lbs are the perfect companions for small to medium sized parts that require high degrees of accuracy and precision. 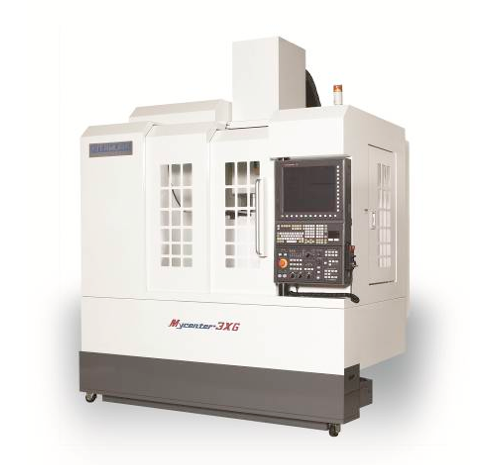 A high speed 15,000rpm spindle speed allows for super fine finish capabilities with reduced vibration, making the Mycenter-3XG an ideal machine for die-mold and 3D applications. Only Kitamura can offer the speed of 1969ipm feed rates on the (X) and (Y) axes, 1417ipm (Z) on solid box ways. High speed cutting has a feed rate of 1,417ipm on the X, Y & Z axes making you “job ready” for high tolerance work. 20 HP (15.0kw) AC/10 Min. 15 HP (11kw) AC/30 Min.